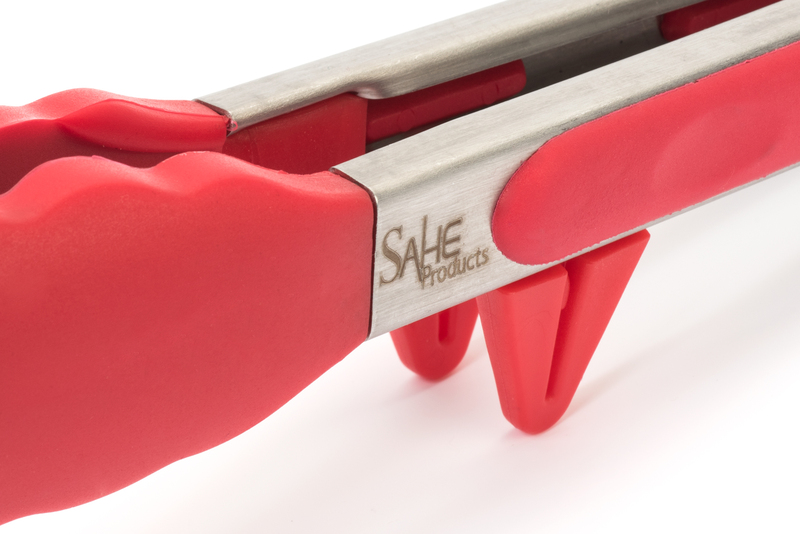 SAHE Products has announced the launch of their silicone stainless steel tongs for the kitchen. The tongs are provided with a built in stand for hygiene and a basting brush for use in barbecues is also provided as a bonus. Aside from barbecues, the stainless steel tongs can also be used for serving salad or as a turner for appetizers. Complete details about the tongs can be found at https://amzn.to/2obGkM1. H. Misra from SAHE Products says: "These stainless steel tongs with soft grip have been designed for those who love to cook. They allow the user to hold on to food even if it is greasy and slippery. Plus they have built in stands to prevent the tongs from touching a surface, thus making sure that bacteria will not be able to get to the tongs and possibly cause health problems. Added as a bonus is a basting brush, which is convenient for barbecues." An important benefit from the built in stands is not just the fact that the tongs won't touch a bacteria-laden surface. It also prevents the tongs from causing a mess on the countertop surface, for instance. And because the tips of the tongs are made from silicone, the tongs are easy to clean. The above have been proven by customers themselves. For instance, one Amazon customer gave the stainless steel tongs a five-star rating and said: "I have other tongs that work on gravity. These, you pull out the red hoop tabs to lock and unlock. I bought these due to the practical design. 1) Easily hang them due to the "hole" in the handle ring. 2) The triangle stands are clever and placed so the tongs stand balanced. They do not tip and not worrying about cross-contamination is great. I think these will be especially efficient for outdoor bbq use..."
Another Amazon customer also gave the tongs five stars and said: "Exactly what I wanted for cooking on my stove. I always hated getting food on the surface & didn't like the thought of cross contamination from my counters." H. Misra likes to point out that the tongs are easy to clean, which means that no bacteria would be allowed to linger on the tongs. Also, the scissor head allows easy locking of the tongs and hanging them on the wall for storage. Customers have actually experienced what H. Misra has pointed out. For instance, one Amazon customer, who gave the tongs a five-star rating said: "... The 2-Piece Salad/Barbecue Tongs are a great addition to my kitchen utensils. [..] But I didn't expect how handy they would be. When I have cooked certain foods in the past, I would be chasing the food around the pan to pick them up with a spatula. I was able to pick up baked mozzarella sticks with no problem with the Lucentee Tongs. Another cool thing is that you can close the tongs for easier storage. [...] The ring on the end pulls out to lock the tongs closed. The tongs are stainless steel with silicone tips which is heat resistant up to 480 degrees fahrenheit so you can use them to flip food in the oven and on the grill...."
Another Amazon customer, who also gave the tongs five stars, said: "... Each pair in this set features an easy to use lock on the end to keep them closed when you need that, and a hook for hanging. Even cooler, they have a built-in rest to keep them from touching the counter when I want to rest them, smart and sanitary; Excellent for a dinner party. I really like this tong set and find them to be of really good quality. I actually compared them to a pair I had bought at a huge mark up that look nearly identical and can't tell a difference." In summary, the stainless steel tongs are suitable for family cooking. They have a comfortable grip and a spring that go easy on the hands of the user. The built in stands avoid cross-contamination. 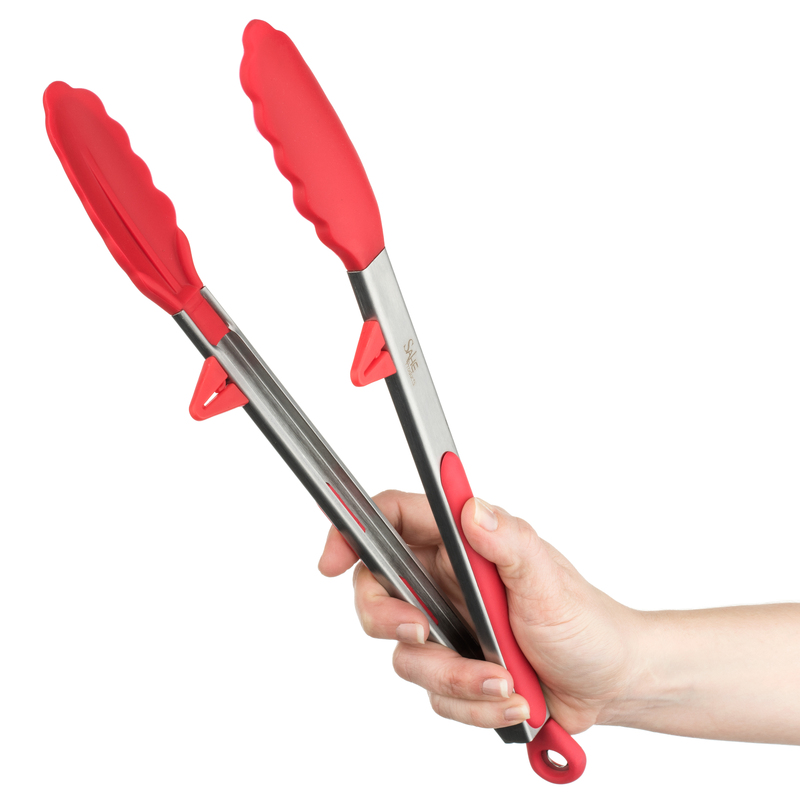 The non stick silicone makes the tongs easy to clean and it also allows easy serving of food. For those who love barbecues, the tongs are great for turning and for serving food. These tongs have also been made to be safe for use in the oven, dishwasher, microwave and freezer. And finally, customers are assured of SAHE Products' lifetime warranty. SAHE Products is a 100% family-owned small business promoting premium kitchen, household products. Their line of products include silicone baking mats, tongs with stand, water bottles, wooden kitchen ladle sets, and bamboo cutting boards. Those interested in getting more information about SAHE Products and its products can visit the company website. SAHE Products is a 100% family-owned small business promoting premium kitchen, household products. Our line of products include Silicone baking mats,tongs with stand,Water bottles, Wooden kitchen ladle sets, Bamboo Cutting Boards.